During my early days as a SBI Youth for India fellow, I was staying at the Kannivadi office of the Partner NGO, MSSRF, before moving to the nearby town of Oddanchtram which was 25 kms away. Searching for accommodation armed with just one Tamil phrase – Veedu Kedikuma [House available for rent?] was a challenge. The universal answer was ‘No’ for bachelors. My companion Bala, another SBI Youth for India fellow and I, began to look around for someone dressed in a shirt and trousers, in the hope that he might understand or speak either English or Hindi. One day when Bala and I were roaming the streets, much like nomads, I finally spotted a man dressed in the attire we were so desperately looking for. The next moment, I found myself beside him, asking “Veedu Kedikuma?”We thanked God that he was able to speak in English and he agreed to help us get a room. He walked around with us and finally guided us to a complex, where he guaranteed we would find accommodation. We managed to get the room only by lying to the owner that we were SBI employees. From then on, each day I travelled 25 kms from Oddanchathram to get to Kannivadi, and then walked for another 2 kms. Lunch comprised of rice and rasam every day. By now, I was totally exhausted with the travel and food. On one occasion, I needed to stay at Thonimalai hills with my assistant for three days, for work. After getting down at the main bus stop, I realized that there was an additional 10-kms walk required to reach the place where we were to stay – a place occupied by the supervisor of an abandoned farm. 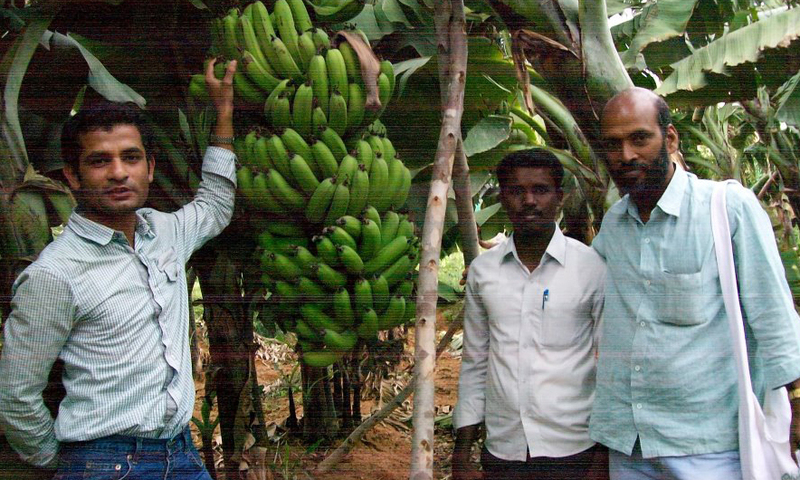 After we finally got there, we found a man who could understand Hindi, with whose help I was able to visit the farms for a preliminary survey in order to identify the problems and determine the project objectives. However, the ground reality was that I had to walk for 10 kms each day, to get to different farms. Once I was back in Kannivadi, I felt like I had fallen into a trap. I realized that I was not going to be able to contribute anything during the fellowship year, unless I was first able to settle in myself. After staying at Kannivadi for two months, I was able to shift to the Wayanad centre of MS Swaminathan Research Foundation (MSSRF ) in Kerala. This time around as well, life there began with house hunting in a place that did not trust bachelors. I think they were just old-fashioned. Many-a-times, this experience made me consider starting this as a business venture, as it was so tough for bachelors to get a place on rent. In fact, my real transformation, rather my interest in the inclusive development of society began here, as I learnt from this experience. After spending some time in the fellowship, I was deeply influenced by the importance of development. Things which seemed mundane earlier now become interesting. 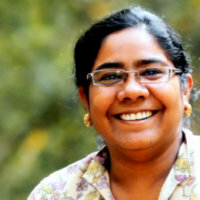 People have often described this fellowship as meant to expose the Fellows to rural India and for them to contribute to rural development in India. But I would say that it teaches us a lesson in humanity and to make it a part of our daily lives. The fellowship program was an enlightening experience that I will carry with me for the rest of my life. I admit that this experience has dominated all my previous experiences and views. I am indebted to the State Bank of India for launching such an initiative. My learning from this experience will surely be tested in the future, but I am confident that I will draw from it and add a bit more humanity to all that I do. During this fellowship, I was lucky to experience happiness from helping others without expecting any returns. Parveen Shaik – What is she doing now? Working as a lawyer in the District Courts of Aurangabad, Maharashtra for close to 5 years, Parveen noticed that 80% of the people coming to court were from rural areas. They were usually illiterate and would travel long distances, spending time and money, simply to be told that they need to come again at a later date. 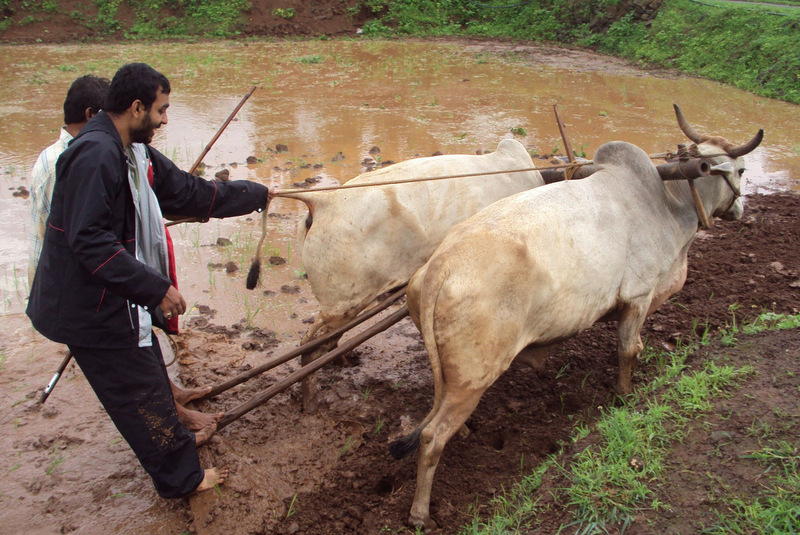 SBI Youth for India alumni Vineet, adding manure to a field. 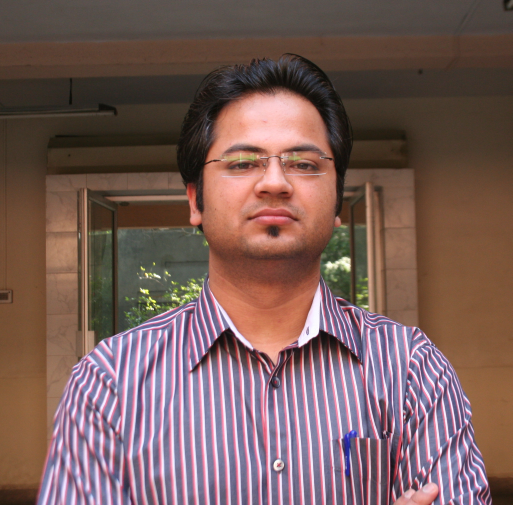 Ankit Walia – What is he doing now? 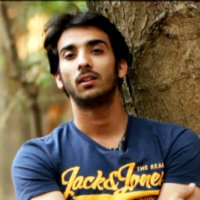 Ankit had worked with Capgemini in Mumbai and on location in Abu Dhabi for 4 years before he joined SBI Youth for India. It was his previous experience of working with under privileged kids that drove him towards joining the fellowship program. While my friends and colleagues share their beautiful experiences of village life, I have a very different tale to share, about a facet of rural life that is rarely talked about. Nevertheless, the story of my colleague in BAIF Dhruva, is worth recounting. I visited a remote village once with my colleague from Dhruva and was struck by the silence. I stopped one of the villagers and asked him questions about the village. Our light-hearted conversation came to an abrupt halt, when the villager and my colleague saw a woman in her mid-40’s coming toward us. They moved aside suddenly and I was puzzled by their behaviour. My colleague’s sudden silence puzzled me and made me wonder about the reason. I questioned my colleague about it as soon as we were out of the village. My questions were all about the woman whom we had encountered there. My colleague’s replies were incoherent, but the gist of it was a shocking piece of information about the villagers’ belief in things like black magic. The entire village held on to this belief and considered one family in the village, as Dacan (a witch) family, having knowledge of black magic, which is passed on from one generation to the next. According to the villagers, the Dacan woman doesn’t like to see anybody being progressive or enjoying life. If she witnesses these, she casts a spell and something bad happens the next day. This belief is very strong in the village and can be sensed immediately by the silence in the village as soon as one enters it. The next day, when I reached the office, I was given the news that my colleague had met with an accident, which not only kept him bed-ridden for almost 2 months but he also suffered a permanent disability in his leg. When I went to see him in his house in the village and asked him about the incident, he did not open up initially. After some probing he said that the Dacan lady, whom we had seen the previous day, had her eyes on him; she was not happy about him having a new bike and a progressive job. It appeared as if she had cursed him, which resulted in the accident. I was shocked to see this blind faith that he and his family had in such theories. Not only that, they had called the traditional village healer to their home and he also informed them that this was all because of the Dacan’s black magic. The story does not end here. I came to know that the villagers believed that the Dacan lives a normal life in the day-time, but after midnight she performs black magic, turns into a cat, a fire ball and rides on a dog but if anybody sees her riding on the dog, that person dies of serious health problems within a few days. The Dacan can also be heard crying at night, which is audible to the villagers. She also teaches black magic to others with a caveat, a prior contract, whereby she would claim a life from somebody in their family. If anyone breached the contract, that person would become mentally ill. Due to such beliefs, the people from that village tie a thread around their neck, arms, ankles, etc. to protect themselves from the ill effects of the Dacan. The ‘power’ that the Dacan wields over the lives of the people in that village seemed absolute, as they went about their activities in mortal fear of her. Education alone did not seem to provide an answer, as seen in my colleague’s case. The only option that the villagers felt they had, was to leave the village and search for a better future elsewhere, far away from the ‘evil eye’ of the Dacan. Excerpts from a Fellow’s diary – Compromise! While being a Fellow with SBI Youth for India, I had a heart-warming experience during a career awareness program that will always strike a chord when I remember those tear-filled eyes. One day an elderly man walked into the Village Resource Centre with his daughter, which seemed natural to me at first. There was curiosity in the girl’s eyes but the father appeared relaxed. The girl spoke simple English but the father didn’t. 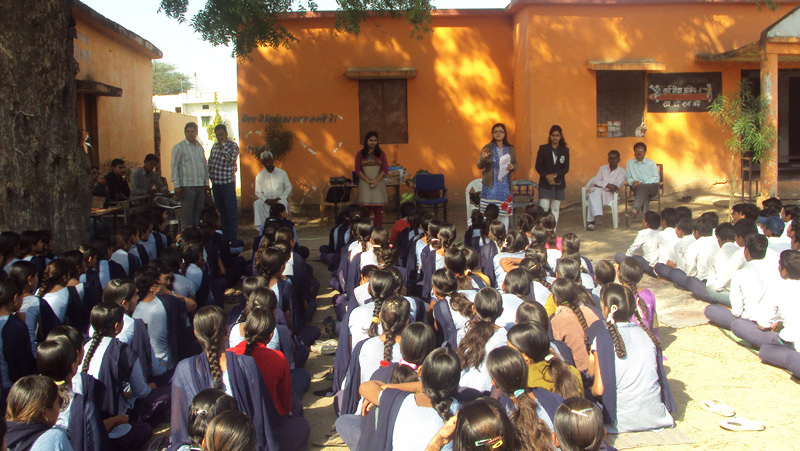 The girl enquired about biotechnology and its career prospects. From my knowledge about a friend who had worked in a good Bangalore-based pharmaceutical company, I told them that the course had good career prospects if she was able to get admission into a reputed college. The girl was not satisfied with my answer and she wanted to know more about the colleges offering Biotechnology and the placements they provided. We called one Biotechnology professor whom I happened to know, to get answers for her queries. She spoke with the professor for a while and his opinion was that the field of biotech is still growing in India and though there is a lot of scope for research work, placements after a Bachelor’s degree are not assured. I could see that she was disheartened. She conveyed what the professor had said, to her father in Tamil. Her father’s expression did not change much, he still appeared content. I however, felt that he still wanted his daughter to pursue the course, even though placements were not assured. By now, the girl’s eyes had moistened. I enquired more about how they earned their living and she told us that her aged father owned a small shop. I realized that the girl’s family was not well-off, rather they lived in poverty. I asked her why she wanted to opt for Biotechnology. She said that she was not sure, but I noticed that she was hiding her moist eyes from me. I tried to empathize with her by saying that when I started studying engineering, I was also not sure why I was doing it. I did well in maths and science and I liked computers, so I chose Computer Engineering. My colleague at the Village Resource Centre, who was documenting and translating, looked at me hopefully. I sensed that he wanted me to suggest some career options for the girl. I paused to look at the girl and her father with admiration. I realized that like every other normal family, they had self-respect and did not want to talk about their financial problems, especially in front of a stranger. I thought to myself how could a compromise between her interests and the employment opportunities that were available to her, be justified. I thought for a while and asked her if she would like to opt for Engineering in Computer Science which could provide her a job in the currently flourishing, Indian IT industry. After graduation, she could work for a while and once she had earned enough to support her family, she could take up a Master’s degree in Bioinformatics; one of my friends had similarly studied Electronics and Communication Engineering and is currently working towards a PhD in Bioinformatics. Although Bioinformatics is not the same as Biotechnology, it involves the concepts of both, Information Technology and Biology. Once I had said this, the girl’s face lit up. – SBI Youth for India fellow, Ankit Walia. His project was to set up a ‘Farmer’s Helpline using IVR’. Akshay Kapur – What is he doing now? June 4, 2014 June 11, 2014 by SBI Youth For India, posted in SBI Youth for India Fellows, What Are the Fellow's Doing Now? An Electronics & Communications engineer from Harayana, AkshayKapur, had worked for a few years in Grail Research, a market research and consulting firm in the National Capital Region. His daily work usually involved data analysis. Throughout his career he had noticed one thing – agitated talk. There was pointless chatter on all sorts of social issues, but rarely any constructive action to improve the situation. This inactivity from educated minds led to his personal turmoil and he took it upon himself to do something about it by joining SBI Youth for India. “Empty glasses and living room debates seemed to be the only tangible contribution of the majority of India’s so called intellectual elite”, says Akshay. During the SBI Youth for India fellowship, Akshay worked closely with BAIF in Udaipur District of Rajasthan on improving the value chain for goat rearing – The IM Goat Project. 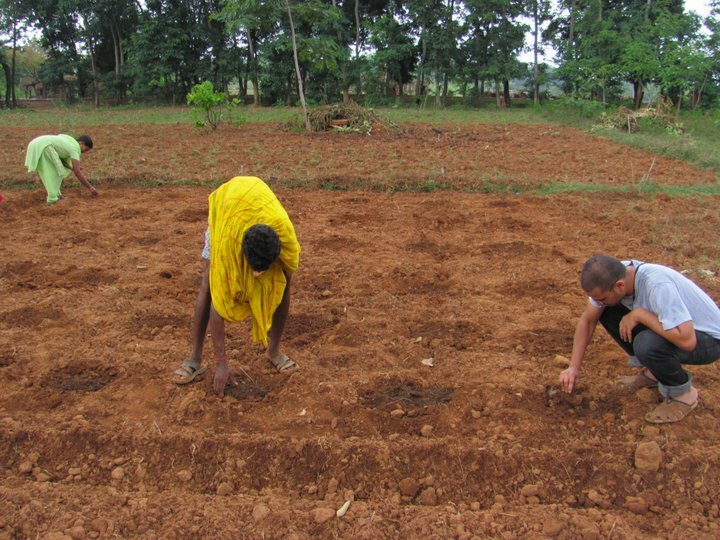 Akshay went through the drill of conducting a baseline survey, training the farmers, documenting and analysing the results. He worked on creating awareness amongst all the concerned parties – the producers and traders regarding the support systems available to them, how they can go about breeding the goats in a systematic manner to make it a more profitable activity. At the end of the year, the project was a success! He says the fellowship turned his thinking around. Gone were his thoughts of ‘helping’ the villagers, he has started learning different and new things from them. Gone were all the definitions and differentiations, washed away in a deluge of experience, no more did he see others as rural or urban, rich or poor, literate or illiterates, upper castes or dalits. Everywhere, all he could see were people! Post the fellowship, Akshay decided against a corporate job but instead took up the Prime Minister’s Rural Development Fellows’ Scheme to work in naxal affected districts. After going through the selection process which involved a competency test, written exam and personal interview, Akshay was selected to work with the prestigious PMRDF Scheme. “The SBI Youth for India fellowship definitely gave me an edge over other applicants” says Akshay. Today Akshay is working in Chattisgarh and will be finishing his 2 year fellowship period in the next 2 months. Over the past 2 years, Akshay has worked on Watershed Management project, State Skill Development Enactment project and has acted as a Supervising Officer for 7 Gram Panchayats i.e. 15 villages. Are you also tired of just talking about what’s wrong with our nation? Then join SBI Youth for India and work towards inclusive growth. After an hour of walking and sweating profusely under the hot mid-day sun, we were in search of transport to the nearest town. We saw a vehicle approaching far on the horizon; it was the ubiquitous Mahindra vehicle, called Maxx. The vehicle is usually expected to seat 11+1, the additional 1 being the driver. The vehicle groaned to a halt in front of us, I could spy three vacant seats in the bench style seating in the last row. I quickly clambered on to the vehicle and then surveyed the scene; there were already 5 people in both the front and the middle rows in addition to the driver. The bench style seat is a local innovation to maximize carrying capacity for 3 people on either bench. The conductor however, was having none of this. He quickly asked us to scurry to our respective corners, thus making room for 4 on either side. Grudgingly, I made way and precariously staked claim to a space enough for one half of my generously proportioned buttocks and heaved one almighty sigh of relief. To my naive mind, the vehicle now appeared full and I thought that we would be proceeding directly to the destination. But the driver had other plans. In some time, he promptly stopped the vehicle for picking up a group of people, who to my credulous eyes seemed to number at least half a dozen! I again surveyed the vehicle in a fit of panic and assessed the situation and concluded that the vehicle simply could not accommodate more than 2 people, who would probably have to cling for their dear lives to the sides of the vehicle. I am sure the reader is aware of the theory (which has been done to death) of the glass of water and the two viewpoints normally associated with this – the glass being either half full or half empty. But our driver had nothing but pure disdain for such minimalist views and his opinion being that such glasses are actually huge empty cauldrons and that there was space for more, always. He again asked the last benchers (of which I was one) to kindly further displace their behinds to make way for this group. Please note that when faced with such dire personal hardship I had shelved my plans of personality judgments, more so as the songs were switched off momentarily in the interest of stuffing the cauldron. The 3+3 benches were then easily converted to seat 5+5 and 2 others in accordance with the author’s assessment clung on to the sides of the vehicle. No sooner had the vehicle moved ahead on its journey, than two young women on the same stretch of the road signaled the vehicle to a stuttering halt. I had now moved well beyond the first stage of panic and began to wonder at the audacity of the two parties involved in the latest act – the two ladies who clearly were not blind, and the driver who clearly knew the situation about the sardines in the can. My powers of reasoning had deserted me completely and there were absolutely no straws to clutch at now. The driver now displayed his deep reserves of enterprise and asked two of my fellow last benchers to clamber on top of the vehicle and the two ladies were accommodated in the seats which provided the safest possible seats under the circumstances. I stirred myself from this reverie and focused my thoughts on to a test of basic counting skills and arithmetic to put a definite number on this experience. I could count 25 people who had decided that this was to be their mode of transport for the next hour. What are the chances of this happening, 25 people on the same stretch of the same highway at more or less the same time, all having a premonition about a vehicle from the grand stables of Mahindra and all 25 of us fulfilling our premonition together? A fateful time of the day indeed! At this point, I would like to offer my heartfelt congratulations to the engineers at Mahindra who released a vehicle for 11 good sized adults into the market, but designed the vehicle to accommodate 25 good sized adults and a pipsqueak. 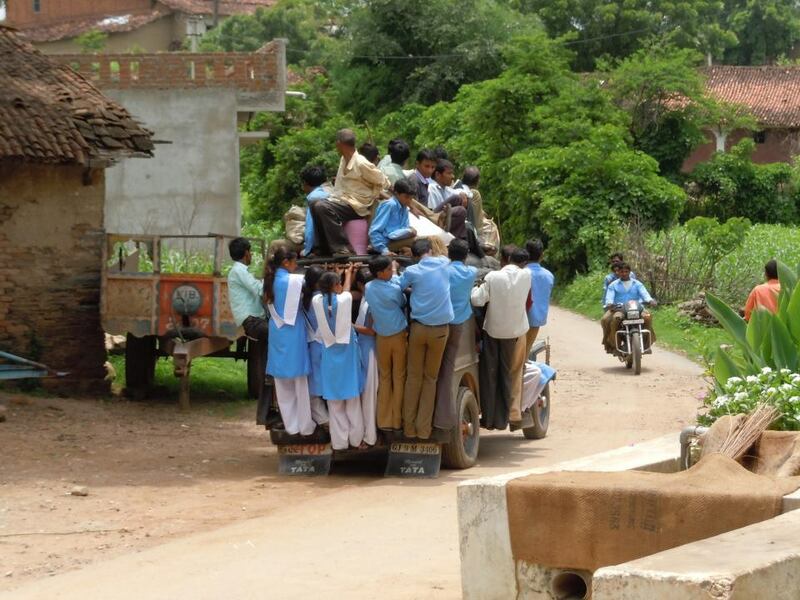 To top this, also designed the vehicle to race at a speed of 70 kmph with this load- truly blessed is the organization that employs such engineers. I now completely understand the reason behind the extra ‘x’ in the Maxx. The reader is now warned that I will attempt to dissect the episode in a serious manner in the section to follow. The entire episode as depicted above is more or less true in nature; the exaggerations are obvious to the reader. But this episode is a perfect example of the Indian concept of ‘Jugaad’. This is a term for an innovative fix to achieve results with meager resources. This concept is apparently the latest fad in management circles, touted as the next big thing from India (South Asia). Management gurus wax eloquent about this and are selling this to their western counterparts. However, I beg to differ on this whole concept. Instead of trying to sell this concept as a management concept, what really is needed is a focus on the ‘meager resources’ part of the problem. Humankind when pushed to the limits in the fight for survival will often resort to such tactics. The tactics adopted may very well be innovative and appreciable, but the idea of celebrating such tactics and propagating this as a way of life is akin to supporting the lop-sided nature of our development and the elitist stranglehold on resources. Just as war and hatred are not natural states of humankind, so is Jugaad not a natural state, it is very often a struggle for survival and should ideally shame the establishment in to tangible and democratic action. In this episode (where I have quite shamelessly chosen to see the humorous aspect completely ignoring the evident human angle of the struggle), the tangible and democratic action needed was quite evident to me. The stretch of the highway I refer to above is a National Highway, where state transport buses ply almost every 5 minutes. However, since most of these buses run on a longer route, they do not stop to pick up passengers on the wayside. I counted a minimum of 3 buses in the space of 10 minutes wherein the buses were almost empty. But since there is no designated stop for the buses, they refuse to stop for the passengers. Moreover, there are quite a number of people who travel as detailed above on a daily basis. Apparently, there is a paucity of state transport buses to plug the demand. However, as evidenced by me, in reality there is no such paucity in terms of the supply (given the fact that long distance buses ply empty). This supply gap is plugged by operators who flout all safety norms in order to maximize their returns per trip. Humorous though, it may have sounded – it is exactly these sorts of practices that endanger human life. 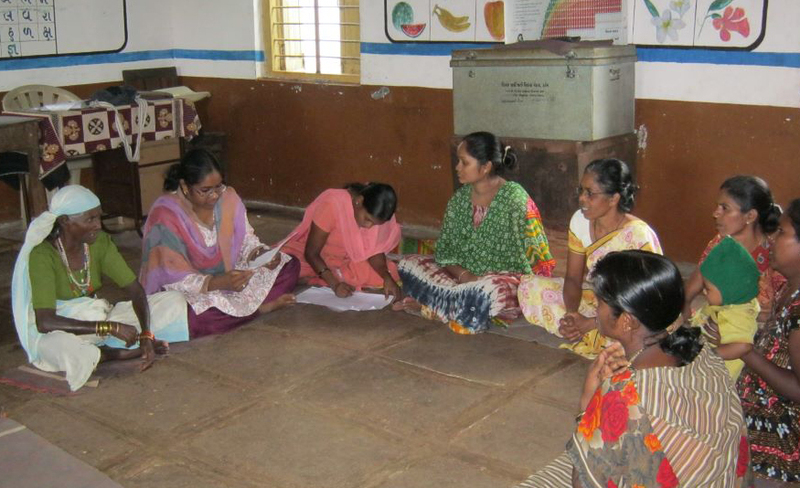 In Bangalore, a recent initiative by the State Government is revenue sharing with the staff. The drivers and the conductors of the city buses including the Volvo buses now get a straight cut (the percentage of which I am not entirely sure) of the revenue that they generate by the ticket sales on a daily basis. Ever since this incentive has been introduced, there has been a sea change in the attitude of the public transport staff in terms of customer friendliness, etc. I would like to point out that the Karnataka State Transport authority is one of the very few state transport authorities in the nation to have consistently generated profits. Returning to the point of the supply side gap in this case, all that is needed is a survey of where people want stops and then the frequency and routes of the buses need to be re-planned. This will not only result in increased revenues, but also increased road safety.